With brands like Glossier and Milk makeup taking over the industry, new makeup trends are taking over too. Trends change often and they tend to be the exact opposite of the one right before it. In the late ’90s and early 2000s, having super thin eyebrows were popular. But in most recent years having thick eyebrows is now the trend. In the same style of trends, this is how dewy makeup was born. In the early 2010s, full, perfect eyebrows, lots of makeup, and matte skin were to die for. This was also the year that the makeup company Glossier was born. As time went on, slowly the dewy look started to take over. It all started with highlighter. When this became a thing, there weren’t very many brands that had it for sale. As it started to gain traction, more and more companies started to release different types. Then, not using as heavy makeup started to come into play. Slowly Glossier started to become more and more known and created their own style. Perfect skin without layers of foundation, blush, highlight, messy brows and glossy lids. The look was low maintenance compared to many other trends in the past. You do not need their products in order to recreate a similar look. But you might need more than what they used to get a similar vibe. Glossier shows models with perfect, almost like glass, skin. I know I need much more than a skin tint in order to achieve what those models have naturally. 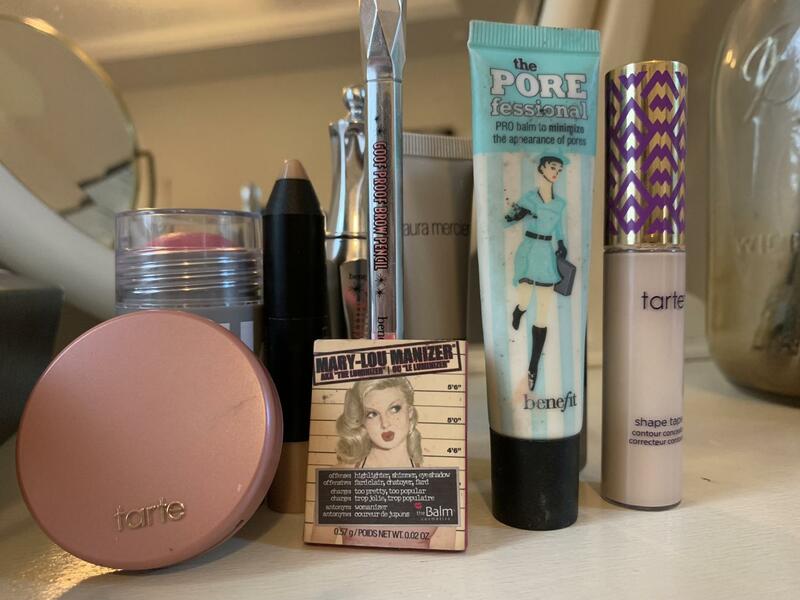 I use primers to smooth and fill in pores, then go in with a heavy concealer on spots where my skin really needs it. Then I use a cream blush (cream blends better and gives it a more natural look.) After that, I’ll apply a cream highlight and set that with a powder highlight (same with the blush.) My finishing touches are filling in and combing my eyebrow hair upwards with a strong eyebrow gel to get their “messy” look. As far as gloss goes, anything will work, even colored, or even Vaseline. Then I top it off with some mascara to make my eyes pop. After some practice, this look only takes about 5 – 10 minutes. Some days I add more or do less depending on what I am more comfortable with. This makeup trend is enhancing natural beauty and encouraging to be happy in your skin. Their minimal makeup products show you don’t need a lot, or any at all to look beautiful. You can use a few products or add several more to this look to achieve the confidence you desire.